Nvidia somehow managed to cram a desktop GPU into a laptop. Read on to find out how. Nvidia said Tuesday that it has hit a true milestone for portable gaming with its new GeForce GTX 980 laptop GPU—true 1:1 performance with its desktop counterpart. That’s right, there’s no ‘m.’ The new GPU is essentially the same as putting a desktop GeForce GTX 980 into a laptop. In fact, Nvidia said, the new laptop GPU is the exact same desktop chip. It has the same 2,048 CUDA cores, the same memory bandwidth, and the same 256-bit memory bus. With the laptop GeForce GTX 980, it says, a consumer can now buy a single-GPU laptop or desktop and get the same graphics performance. Why this matters: Never before has single-GPU performance ever been at parity between laptops and desktops. That meant consumers who needed to take their gaming on the go have always had to compromise. That era ends with the new GPU. Nvidia says it has essentially stuffed this GPU into a laptop. So how do you take a ginormous GPU like the desktop GeForce GTX 980 with its 165-watt thermals and power requirements and jam it into a laptop? Very carefully. Kaustubh Sanghani, a general manager with Nvidia, said to pull off such a feat, the chips are first sorted for power requirements. Known as “binning,” chips can be sorted like diamonds for certain characteristics. Sanghani said the chips with the best power characteristics make the GeForce GTX 980 what it is. You might think this approach means it’s a limited-edition vapor part that vanishes once the cream of the crop is exhausted, but Nvidia said it’s not. 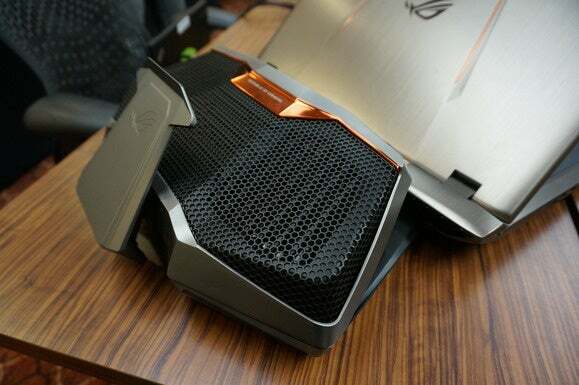 The company, in fact, is going out the gate with no fewer than six laptop models from partners including Aorus, Asus, Clevo, and MSI. Besides the binning, Sanghani said cramming a desktop GPU into a laptop also took an enormous amount of engineering to shrink down the board. One issue Nvidia said it had to solve was the trace routes, or the path of the wires that run between the GPU and the RAM. For the utmost in performance, graphics cards use very wide parallel memory buses, which means cramming identical-length wires into a tiny amount of space. This can lead lead to interference that can kill performance, but Sanghani said the new card can hit the same exact same memory bandwidth of the desktop card. When asked if the use of HBM memory would have been easier, Nvidia officials said this new GTX 980 hit the RAM speeds it needed to with what it has, and oh yeah, unlike HBM, you can actually get the GDDR5 used in the new GPU. AMD and its RAM partner SK Hynix have never commented on the yields of the new HBM memory, but there’s growing suspicion in the industry that the hard-to-get next-generation RAM could be holding back wider availability of AMD's new Fury lineup. It’s mostly an academic discussion anyway, as the GeForce GTX 980 was always designed for GDDR5. Sanghani said the other engineering feat in the new GeForce GTX 980 is supplying enough power to run it. 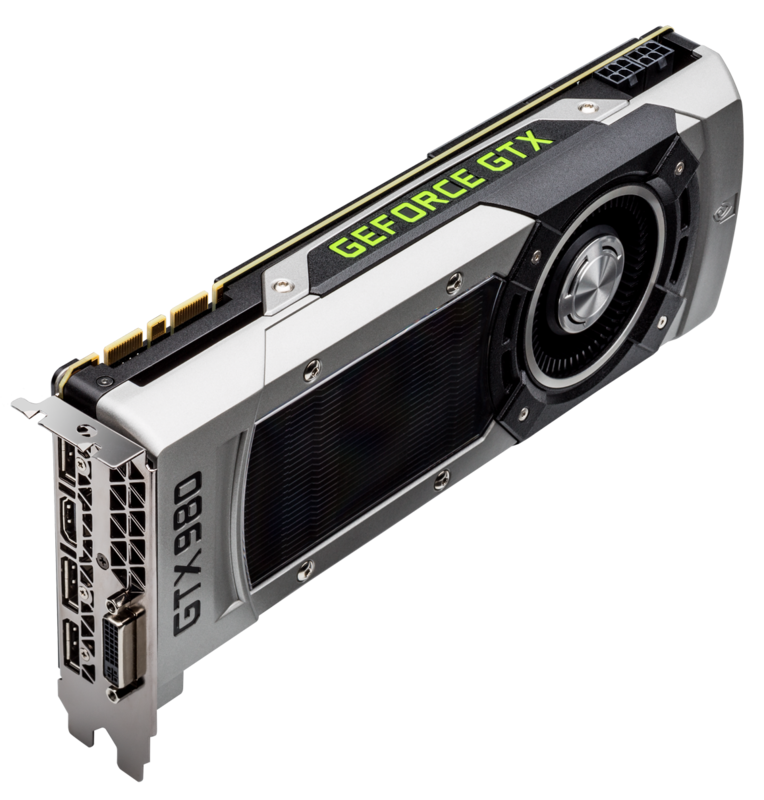 While the GeForce GTX 980m uses three-phase power, he said, the GeForce GTX 980 was designed to be built with four to eight phases. If you think of a phase as an individual channel, adding more phases generally means each channel has to work less, which in theory increases reliability and stability. With the new design, Sanghani said there's 50 percent more peak current available to the GPU than there is for the GeForce GTX 980m. Normally this wouldn’t matter that much, but Nvidia also intended for the new GPU to be very overclocker-friendly and overclocking usually requires access to a very clean, stable power source. Overclocking implementation can be decided by the notebook builder and will be dependent on the capabilities of the platform, but one demonstration showed the card running with about a 200MHz boost overclock. The same design flexibility goes for thermals. Nvidia didn’t release details of the thermal design profile of the new GPU, saying it’s dependent on the laptop design. 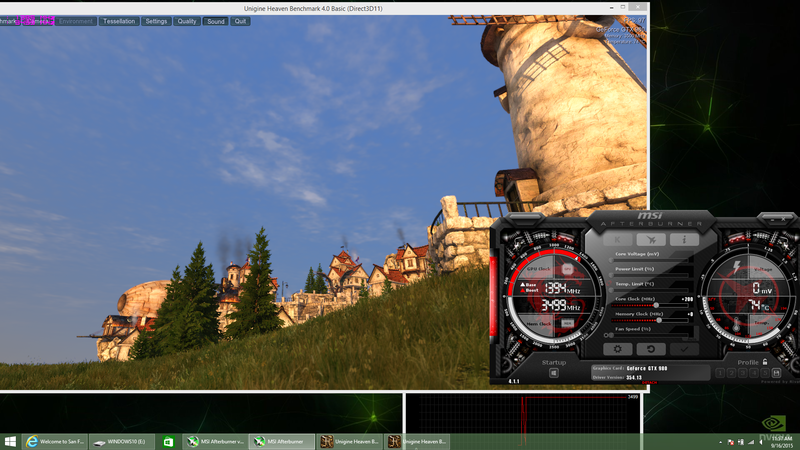 Overclocking is unlocked on the new GeForce GTX 980 too. Well, except for voltage. 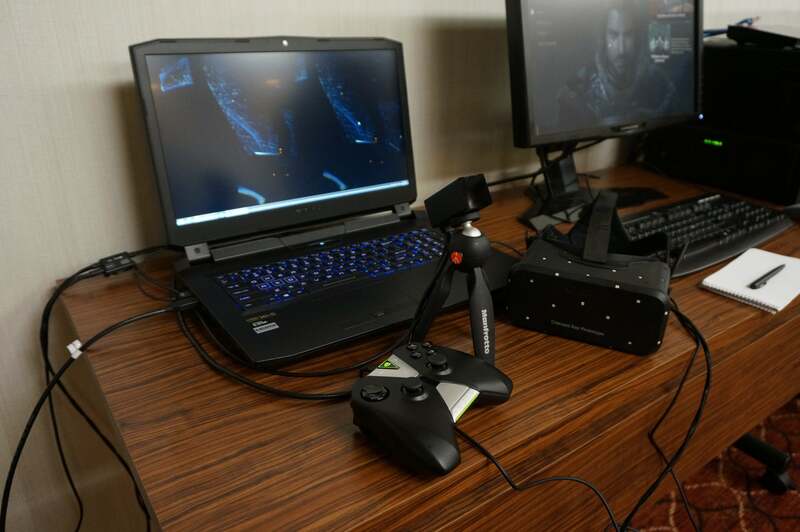 Nvidia said the new laptop GeForce GTX 980 is the first mobile GPU capable of running VR. The company demonstrated an Oculus Rift Crescent Bay running several games and demos. While you might think the tiny screen in a VR headset doesn’t require much graphics power, it actually needs more. Gaming on a standard two-megapixel, 1920x1080 monitor at 60 fps takes about 120 million pixels per second, Sanghani said. But gaming on, say, the HTC Vive requires the GPU to push 1680x1512 per eye and also run at 90 fps. That means the GPU now has to push about 450 million pixels per second. Nvidia says the new laptop GeForce GTX 980 is the first GPU capable of supporting VR. While I can see someone hauling around a gaming laptop with a Crescent Bay, the second use case for all this power seems a little less likely. Surround gaming has been possible on a laptop for sometime, but Nvidia said the GeForce GTX 980 can now push it all in a single GPU. It showed off another Clevo unit running Project CARS on three 1920x1080 monitors in surround. 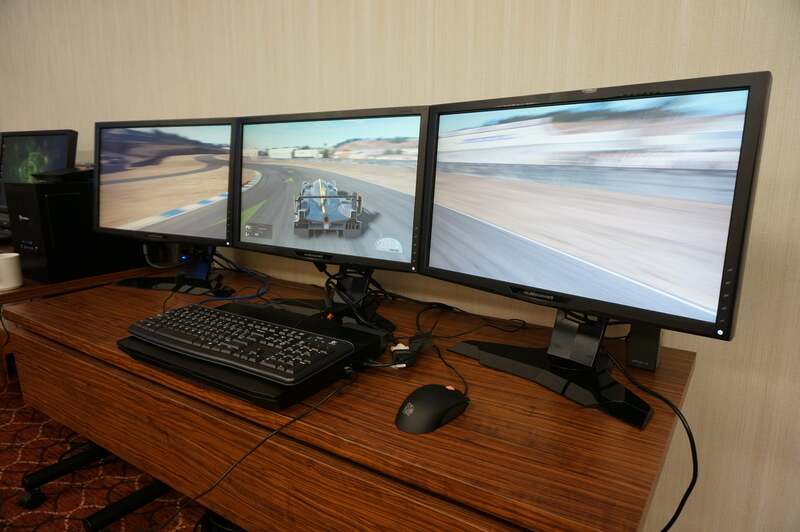 A single laptop with a GeForce GTX 980 is shown here running Project CARS on three FHD monitors. This Clevo actually includes a desktop Skylake CPU. Read on to see the lineup of GeForce GTX 980 laptops and their performance.